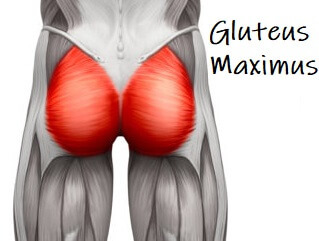 Gluteus Maximus, as the name implies, is the largest of the three gluteal muscles. It sits over the top of the other two muscles, gluteus medius and gluteus medius, and while they are all about stability and control, gluteus maximus is all about power. 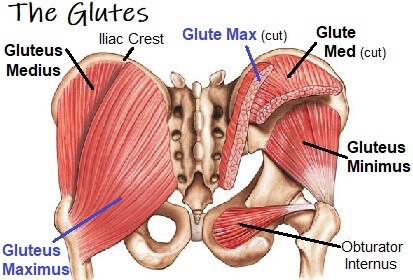 Glute Max is found at the back of the hip forming a large part of the shape and appearance of the buttocks aka glutes. It is the muscle that allows us humans to walk upright. 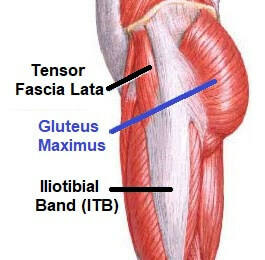 Gluteus Maximus is quadrilateral in shape and thick, made up of bundles of muscle fibers lying parallel to each other. It originates from a relatively large area on the pelvis. Starting at the top, it attaches to the gluteal surface of the ileum, just behind the posterior gluteal line, the posterior border of the ileum and the adjacent part of the iliac crest. The bottom part of the attachment is to the side of the coccyx (tailbone) and the posterior surface of the sacrum, including the upper part of the sacrotuberous ligament, the fascia of gluteus medius and the aponeurosis of erector spinae. If you imagine placing your hand in the back pocket of your trousers, this will largely cover the area of the pelvis that gluteus maximus arises from. The muscle fibers of gluteus maximus pass downwards and backwards towards the top of the femur and form two layers as they approach the insertion point. The larger upper layer narrows, passes over the greater trochanter and attaches between the two layers of the fascia lata helping to form the iliotibial band/tract. The deeper, lower portion of the muscle fibers form a broad aponeurosis (layer of broad, flat tendon, silvery-white in appearance) which attaches to the femoral gluteal tuberosity between vastus lateralis and adductor magnus. Gluteus maximus works in a number of ways depending on the position of the body. When acting from above (i.e. the pelvis is the fixed point), it pulls the femoral shaft backwards from a flexed position, extending the hip in to line with the body. To put it simply, it produces extension of a flexed hip joint such as the push up phase when climbing stairs, stepping up onto a step or coming up from squatting. It plays little part in normal walking. It tends to rotate the thigh slightly laterally (outwards) as it extends. The upper muscle fibers help to abduct the hip (draw it outwards) while the lower fibers adduct the hip (draw it inwards). When acting from below (i.e. the femur is the fixed point), gluteus maximus supports the pelvis and trunk on the femur so we can stand upright. It's most powerful action is working with the hamstring muscles (semimembranosus, semitendinosus and the long head of biceps femoris) to pull the pelvis backwards and lift the trunk from a flexed position e.g. coming up to stand up straight from bending forwards. The fibers that help form the iliotibial band can help to produce knee extension and provide lateral stability around the knee. Gluteus maximus also plays a part in maintain good foot position. Its ability to aid lateral rotation of the hip helps to raise the medial longitudinal arch of the foot. You can test this by standing completely relaxed and then clench your glutes tightly together. The inner border of your foot will likely lift up slightly, particularly if you have flat feet. It also provides cushioning when we sit, subtly contracting at times to redistribute weight to relieve pressure on the bony points of the ischial tuberosities – if you sit on your hands, these are the bony points that you will feel digging in to your fingers.